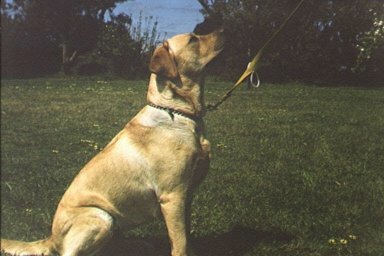 Jamareine Labrador was registered in 1999. 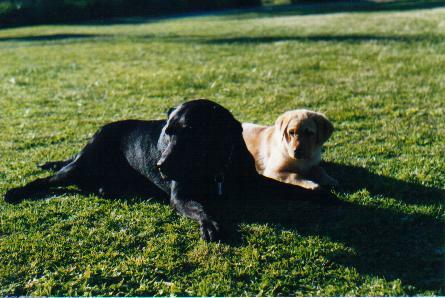 Our first two labradors were Jasper (Graebar Tyler in Black) and Reine (Lochindorb Silver Sage). The name is a combination of 'Ja' from Jasper, 'ma' from Maureen and 'Reine'. Says Maureen: "My father was a visual person . He spent many years working on and building the house I grew up in. He loved gazing at the sunsets at night after a hard day's work. He was diagnosed with diabetes later in life and because of it, lost most of his eyesight. I feel it was his sight impairment that lead him to lose hope, become depressed and eventually succumb to the disease. The reason I began Jamareine Labradors was to try to give back to the blind in some way - to make their lives better. So, we try to meet the needs of SEDA (Seeing Eye Dogs Australia). They have first pick of all of our litters and we are ecstatic when any of our pups graduate as working seeing eye dogs. Only a very small number of dogs, ours included, ever make it all the way through as there are strict requirements and conditions. However, those that don't make it are homed as companion dogs for the disabled - another honorable position. I wish I could have done more for my dad when he was alive, but I believe he is proud of what we are trying to do. 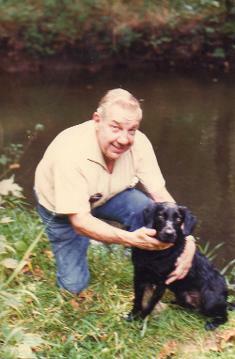 In many ways, Jamareine Labradors is dedicated to my father, Foster Brandon, and his memory. God bless anyone out there who is struggling with sight impairment or disabilities." All of our dogs have hip and elbows tested and scored. They have current clear eye certificates and have DNA testing to rule out as many hereditary problems as possible. 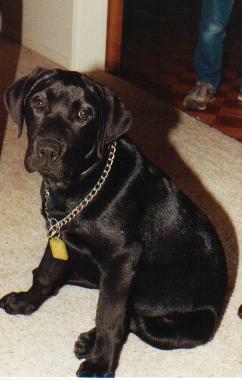 Jamareine Labradors is dedicated to breeding sound, healthy labradors with good temperaments. All labradors have excellent pedigrees and are considered part of our family. With nearly five acres to roam and the ocean beaches ten minutes away, Jamareine labs get plenty of fresh air, swimming and exercise. Their diet is based on the B.A.R.F. (Biologically Appropriate Raw Foods) program of all natural foods (see Feeding Your Dog). Jamareine labs are well looked after, exercised and much loved. Life is not complete without a labrador!